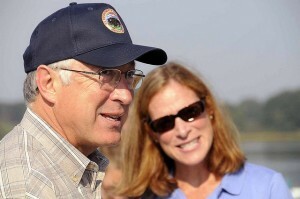 With Secretary of the Interior Ken Salazar announcing his resignation recently, effective at the end of March, more than one river conservation organizations will be mourning his loss. “Secretary Salazar has been a true champion for protecting and restoring rivers and his leadership will be missed by everyone who cares about healthy, free-flowing rivers,” says Bob Irvin, President of American Rivers. As well as filling Salazar’s position, President Obama will have two other major environmental positions to fill. Last month, the head of the Environmental Protection Agency (EPA), Lisa Jackson, and the head of the National Oceanic and Atmospheric Administration (NOAA), Jane Lubchenco, also announced their resignations. While Salazar’s time at the DOI was spent largely on dealing with the BP/Gulf of Mexico oil spill in 2010, one of his biggest contributions was setting aside hundreds of thousands of acres of land in the western United States for future solar and wind power development. That, and continuing to champion our nation’s clean, free-flowing waterways, of which there’s still much work to be done.